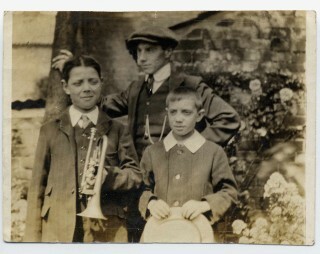 Bob Sutton (left) holding a cornet; Philip Sutton, his cousin, wearing a hat. Frank Sutton his younger brother, holding a straw hat. Frank died in 1919 a casualty of the Spanish Flu epidemic. Philip served in the Durham Light Infantry. He survived injury at the Somme in September 1916. He was killed in the March 1918 German Offensive. Bob Sutton possibly on home leave. Note the well worn footwear. 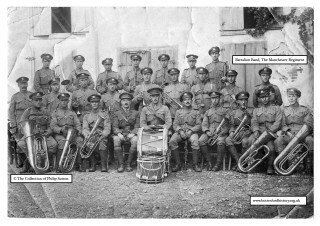 Bob Sutton with cornet centre middle row standing. Bob and Rose Sutton at home in 1981. Born in 1899, Bob Sutton enlisted at 15 years old and served as a bugler in the Manchester Regiment. 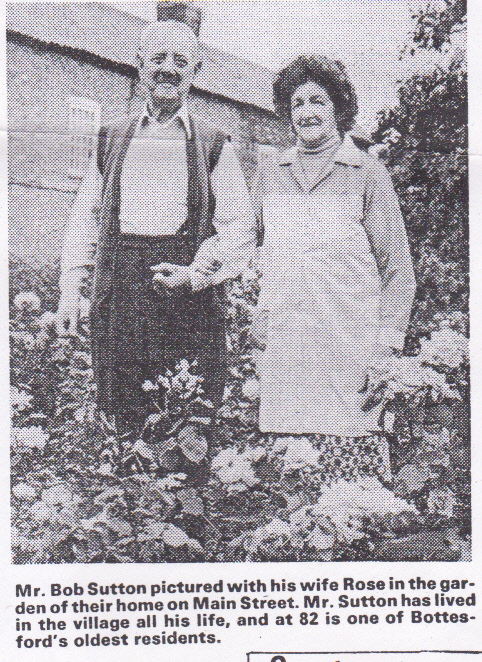 Bob was the son of Philip and Eliza Sutton who lived on the High Street in Bottesford with their family of 9 children. 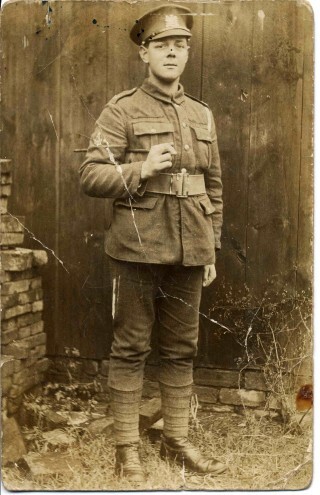 Both he and his elder brother William (Bill) survived active service in the 1st World War. Both also served in the Middle East but in different Regiments. 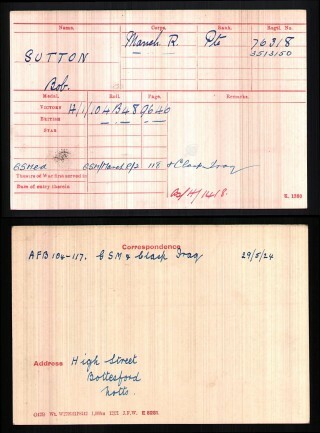 Bill Sutton served with the 2nd Battalion The Leicestershire Regiment. Bob is seated on the right. 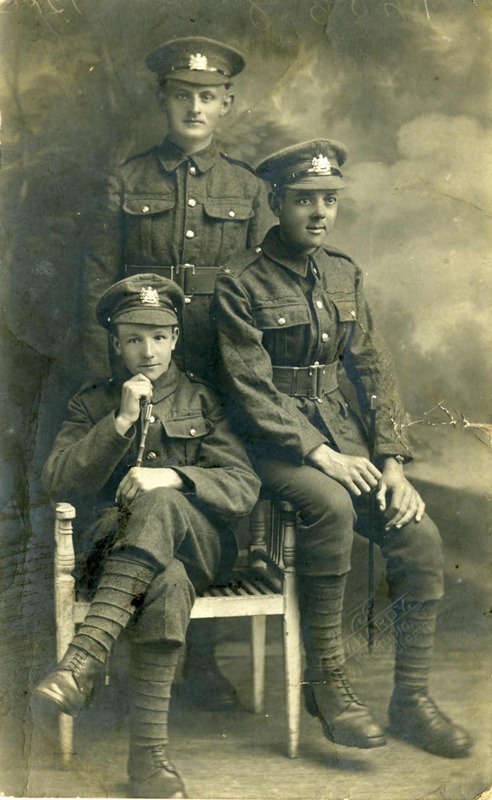 All three of these young soldiers look too young to be in uniform. All of them display cap badges of the Manchester Regiment. The postcard photograph is embossed with ‘JW Hardy Studio, Cleethorpes’. The 3rd and 4th Manchester Battalions were moved in late 1914 to defend the Humber and were stationed in Cleethorpes and Grimsby. As yet we do not know in which of those two reserve battalions Bob Sutton served. (We have found another photograph from JW Hardy’s Cleethorpes studio also showing a uniformed sergeant from the Manchester Regiment. 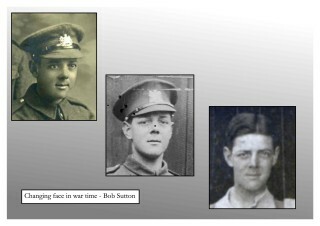 The background is identical to the one in Bob Sutton and his colleagues – click on the following link for details in the Manchester Archive+). 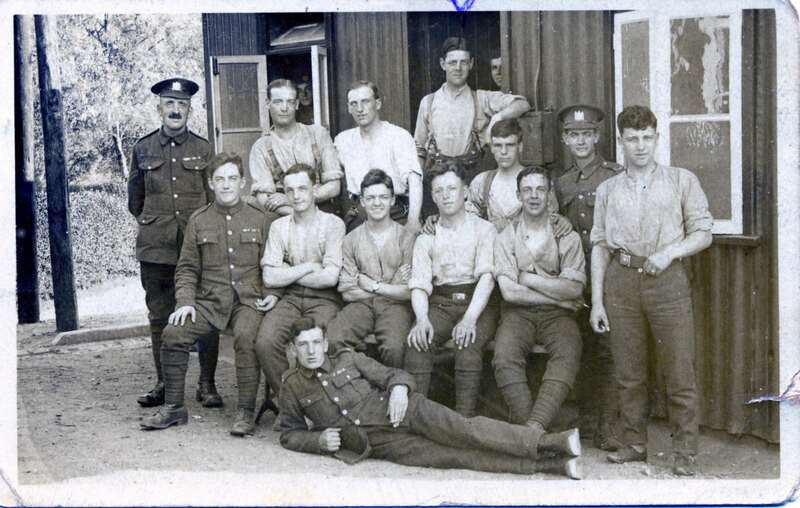 The 3rd and 4th Battalions of the Manchester Regiment remained on home service for the duration of the war. 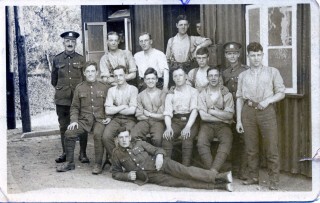 However the 1st Battalion was posted to the Mesopotamia in early January 1916. It is likely that Bob Sutton was posted from a reserve to the front line 1st Battalion. Unfortunately his war records appear to have been amongst those destroyed in the 2nd World War bombing of London. 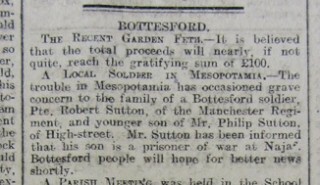 Further work is needed to discover exact details of the Manchester Regiment’s service in Mesopotamia. The war would not end for Bob in 1918. The Grantham Journal, 4th September 1920, reports the concern the family had experienced over his whereabouts at the end of the conflict. The late Captain George Stuart Henderson, D.S.O., M.C:, 2nd Bn., Manchester Regt. For most conspicuous bravery and self sacrifice. On the evening of the 24th July, 1920, when about fifteen miles from Hillah (Mesopotamia), the Company under his command was ordered to retire. After proceeding about 500 yards a large party of Arabs suddenly opened fire from the flank, causing the Company to split up and waver. Regardless of all danger, Capt. Henderson at once reorganised the Company, led them gallantly to the attack and drove off the enemy. On two further occasions this officer led his men to charge the Arabs with the bayonet and forced them to retire. At one time, when the situation was extremely critical and the troops and transport were getting out of hand, Capt. Henderson, by sheer pluck and coolness,, steadied his command prevented the Company from being cut up and saved the situation. During the second charge he fell wounded, but refused to leave his command, and just as the Company reached the trench they were making for he was again wounded. Realising that he could do no more, he asked one of his N.C.O.’s to hold him up on the embankment, saying, “I’m, done now, don’t let them beat you.” He died fighting..
(We are most grateful to Geoff Smith for providing assistance and information on this and for access to Manchester Guardian newspaper articles of the 25th September 1920 giving details of casualties and prisoners, and a list of released prisoners on 19 November 1920. Please see a Dark Desert Night: Hilla, Mesopotamia, July 1920 for further information on the Hillah action). The Grantham Journal does not report any details of his release from captivity. However the Manchester Guardian reported that “Sutton, Pte. 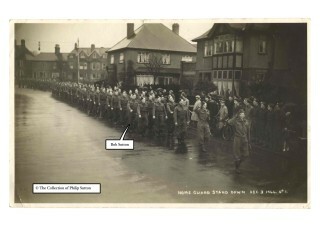 R.” was released as part of a group of 74 prisoners to rejoin “British Forces”. 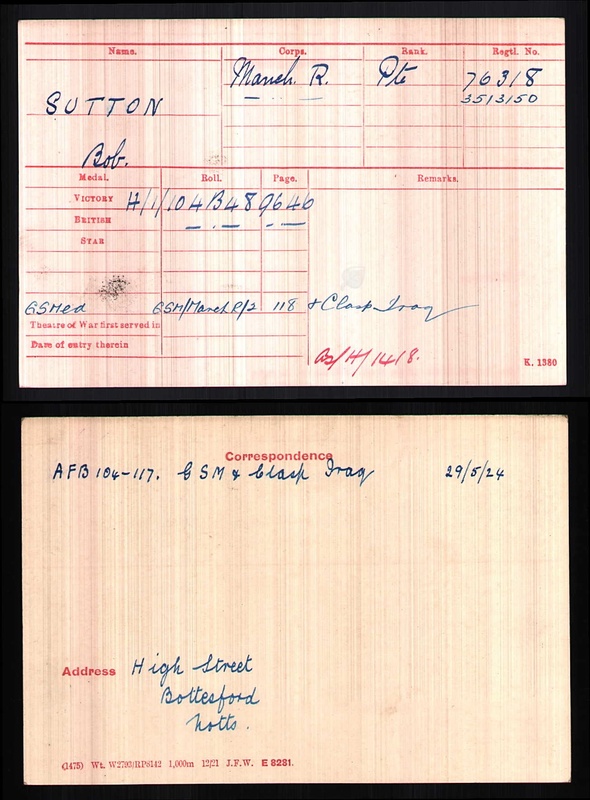 His Medal Index Card survives and shows that he was awarded the Victory Medal, the British War Medal and General Service Medal with ‘Clasp Iraq’ on the 29th May 1924. The Clasp Iraq was awarded to those who either served: at Ramadi or north of a line east and west through Ramadi between 10 December 1919 and 13 June 1920; or were part of an establishment within Iraq between 1 July and 17 November 1920 (see General Service Medal 1918). His Medal Index Card also gives two service numbers. Was the second allocated on his transfer from the reserve? We can also see the ‘High Street Bottesford, Notts.’ as his home address. Bob Sutton returned to civilian life within the community. 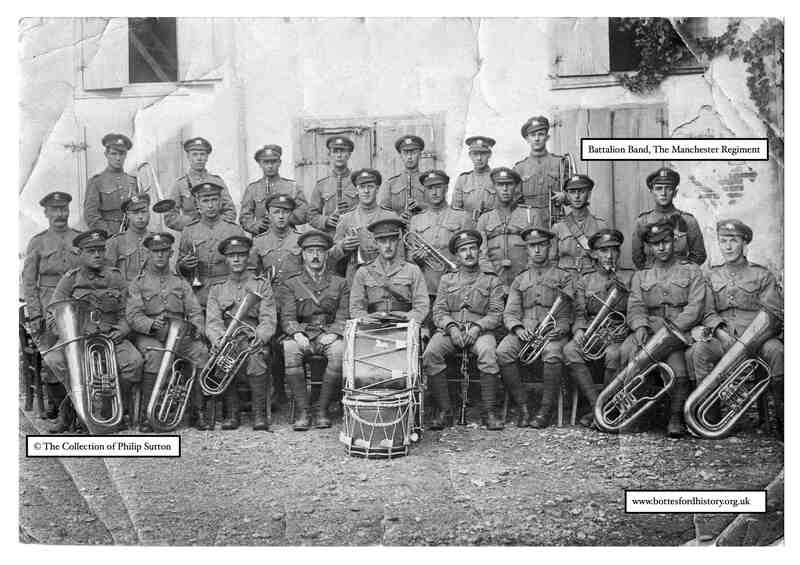 He continued the Sutton family musical tradition as a long term member of the Bingham and Bottesford Brass Band. His cornet is still in the possession of the family. He served in the Home Guard in WW2, worked on the railways as a plate layer and crossing keeper then latterly for the local builder William Roberts. 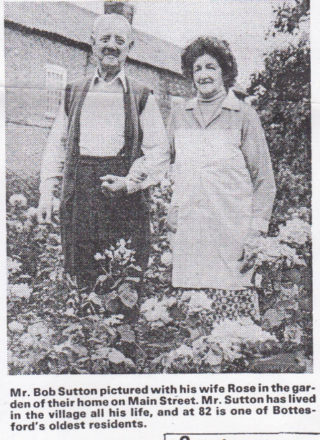 A keen gardener he entered many of the local horticultural shows with produce from his extensive vegetable plot on the High Street. 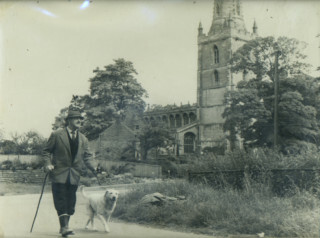 He was a life long follower of the Belvoir Hunt and gun dog owner. This page was added on 04/06/2014.